here to get the pdf version. Update June 3, 2016. The Board is pleased to announce that it is now official: A contract has been signed by President John Upcott and Rev. Fran Dearman. Rev. Dearman will become Interim Minister at the UU Church of Olinda, starting in August 2016. Her appointment is for one year, renewable for a second year. Reverend Dearman comes from Victoria, BC, with valuable interim-ministerial experience at UU Churches in Mississauga, Winnipeg, Calgary, Halifax, and most recently at the North Shore Unitarian Church in Vancouver. She is a fully Accredited Interim Minister (AIM) with special training to help the UU Church of Olinda transition to acquiring a new settled minister. 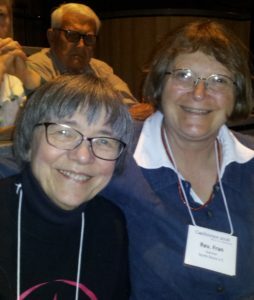 Here is a photo of Reverend Dearman (on the right) with Bobbye Baylis, a member of the interim minister taskforce, taken during the Annual Conference of the Canadian Unitarian Council on May 20, 2016, in Vancouver. Welcome to Olinda, Ontario, Rev. Fran! UUs from UUOlinda are invited to attend the UU Regional Spring Gathering on Belle Isle on Saturday, May 21, 2016, from 11 AM to 3 PM. Join our UU friends from Michigan! See flyer for details: UU 2016 Belle Isle Picnic Flyer. educated in Windsor. Eleanor was awarded an honorary degree from St.
volunteer work with people, in particular with cancer survivor groups. All are welcome, both men and women. Tea and cookies will be served in the library or around the kitchen table.